This is the first album Asher recorded with new friend and colleague Phil Thornton, in 1990. The old 8-track recorder used was borrowed from Tom Newman, who lived nearby, and who had used it to record Tubular Bells with Mike Oldfield. 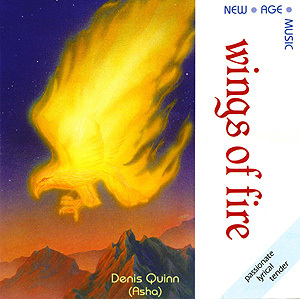 Wings of Fire topped the new age charts around the world, as had Open Secret and Mystic Heart before it, but it was deleted by New World after 2004, and Asher has put five of the six tracks into other compilations now. Notable is the thrilling 13-minute title track, inspired by a long, snaking train journey through Mexico in 1980, and partly also by the works of Carlos Castaneda that Asher was reading at the time. Also notable is the spiritual ballad 'This love', still used today by several humanitarian organisations as an anthem.